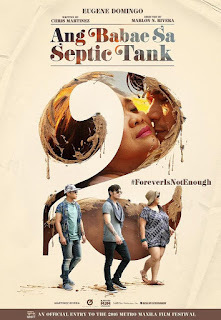 One of the entries in MMFF 2016, the sequel of the hilarious Ang Babae sa Septic Tank, led by the comedian Eugene Domingo, released in the cinemas last December 25, 2016 under the direction of Marlon Rivera and written by Chris Martinez. Ang Babae sa Septic Tank 2: #ForeverIsNotEnough story where Eugene Domingo playing as a fictionalized version of herself, is asked to do a romantic drama movie entitled, "The Itinerary". But along the way, she ended up suggesting and insisting her ideas to the director played by Kean Cipriano that remolded the original story into a romantic comedy. From the picking of Eugene's love team for the movie to their 'hugot' lines and antics the movie will make you laugh out loud. Eugene Domingo demonstrated how versatile she is in doing her craft. It made me admire her more now. I cannot oversell this movie anymore, so, I recommend you to watch, Ang Babae sa Septic Tank 2: #ForeverIsNotEnough and experience a comedy that you will surely wants and deserves.